Event Mode Timing: In Event mode, delays in the onset of an event do not affect the specified duration of the event. 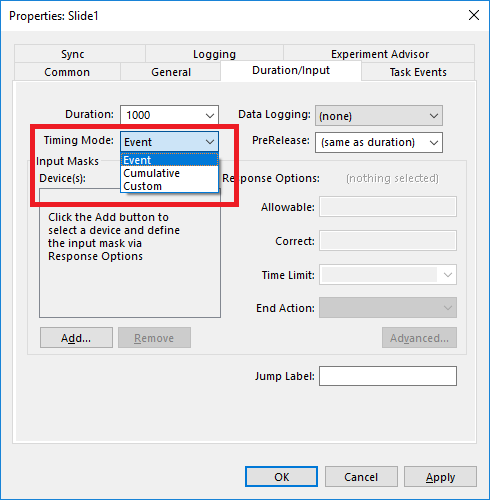 Cumulative Mode Timing: In Cumulative mode, delays in the onset of an event result in an equivalent reduction in the duration of the event, such that the cumulative timing error is minimized. As an example, a TrialProc has 3 TextDisplay objects, each with a Duration of 1000ms. During a specific trial, the second TextDisplay object experiences a 15ms onset delay while waiting for the screen to refresh. In Event mode, E-Prime ensures that the object is displayed for as close to the specified duration (i.e., 1000ms) as possible. No adjustment is made to compensate for the delay. The total duration of the trial is 3015ms (i.e., 1000ms + 15ms delay + 1000ms + 1000ms = 3015ms). In Cumulative mode, E-Prime reduces the duration of the object to compensate for the delay. That is, the object is displayed for 985ms instead of 1000ms. This ensures that the total actual duration of the trial is as close to the intended duration (i.e. 1000ms + 15ms + 985ms + 1000ms = 3000ms) as possible. In general, use Event mode timing when you want to ensure that each object is presented for as close to its specified duration as possible, and use Cumulative timing when you want to ensure that the length of an entire trial is as close to the specified duration as possible.